Wits University, Johannesburg — Rodney Genga got his hands on the trophy and vowed to hold on to it forever after his team Wits University held on for a well deserved 56-47 victory against Randburg Rhinos in the 2014 Friday Night Lights Finals. 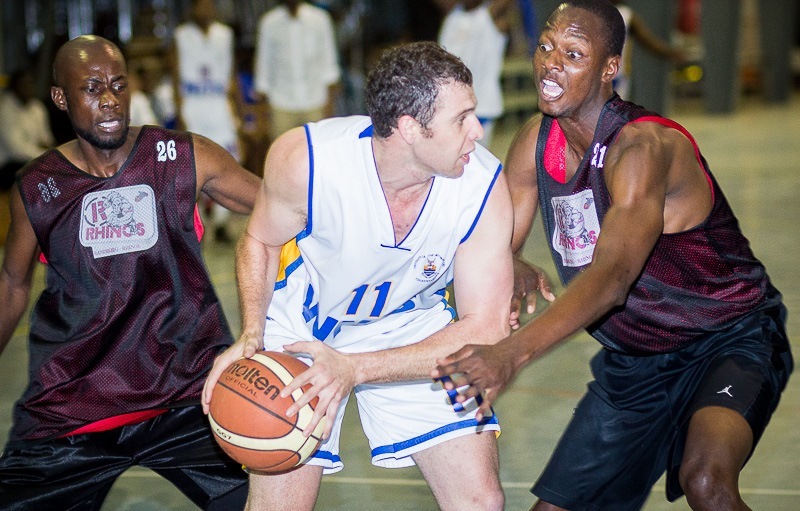 The finalists both came through excellent victories in the semi-finals with Rhinos edging Phoenix 56-54 and Wits sailing past a deep Phenoms team 35-23. Those victories set the scene for an expected humdinger played by the top two teams in the regular season both with 6-1 records but Rhinos having the slight edge on the table standings because of the head to head matchup after beating Wits 43-38 earlier in the season. That regular season result and the fact that they were defending the title in a format of the game that they absolutely dominate would have given Rhinos the belief that this title was theirs lose. Wits won the opening exchanges and appeared determined to not repeat the mistakes that had cost them in the ICSL finals on the same floor against another defending champion just 6 months previously. The students appeared to have taken in the lessons learned back then and made an effort to dispense with their usual slow start which was necessary in a game format where mere 5 point leads can appear to be insurmountable mountains. The assault by Wits was led in chief by Helio Inguane, Jonathan Van Der Bijl and Ryan Maroun. Inguane in particular continued with his devastating form throughout the FNL and appears to have grown in this Wits squad. Rhinos for their part made an uncharacteristically slow start to the contest and their blistering speed was slowed down by a Wits 2-3 zone defense that needed time and patience to pull apart which didn’t seem to suite the Rhinos especially with set up point guard Treasure Karoy doing significant spells on the bench. Timely contributions from Fiston Mazowa, Wisani Chauke and Graci Miller kept Rhinos in contact and prevented an early surrendering of the contest. Wits led 35-19 going into the half firmly in control of the contest. The prophetic words which were heard in the Wits huddle at the half came true immediately at the start of the 2nd half. Rhinos regrouped, refocused, reenergised and altered their defense to an up-court man to man press that had the students reeling for the better part of the 2nd half. Turnovers aplenty affected Wits which led to fast breaks, fouls and easy points on the other end. In fact had more of the lay-ups and free throw shots that Rhinos got from steals been converted the lead would have been cut to low single digits. Those missed opportunities would come back to haunt Rhinos when Inguane was reintroduced into the game after having been inexplicably left on the bench at the start of the 2nd half and the whole period when Wits was struggling. Inguane steadied the ship and stemmed the tide of turnovers. Having another ball handler on the floor definitely paid dividends. Inguane seemed to be involved in absolutely everything from there on out from difficult trick shot 3 point plays to unnecessary technical fouls, great assists and timely buckets. The students closed the game out comfortably in the end and walked away 56-47 winners to lift the trophy for the first time. Getting it back from them will not be easy. Earlier in the day Phenoms took 3rd place beating Phoenix 57-45 in the 3rd place playoff. This entry was posted in FNL. Bookmark the permalink.